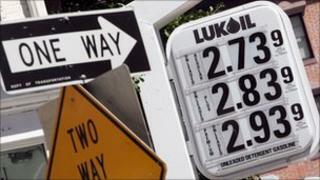 ConocoPhillips, the US's third-largest oil firm, is to sell its entire 20% stake in Russian oil giant Lukoil. The move, which Conoco said was to boost shareholder returns, came as it announced a better-than-expected net profit between April and June. It made $4.2bn (£2.7bn) in the period compared with $859m a year earlier. Conoco shares rose by about 2.5% on the two announcements. Previously it had said it would sell half its holding in Lukoil and keep the remainder. But chief executive Jim Mulva said it had made the decision to sell the entire stake "given the expected business environment and our stated strategy to enhance returns and increase distributions". The Houston-based firm will sell 40% of its Lukoil holding back to the Russian company for $3.44bn, then sell the remainder by the end of 2011. The decision to offload the entire investment was good news, said oil analyst Brian Youngberg of Edward Jones, who added there had been questions over why Conoco had planned to keep half its stake. "While it has been a good investment for the company, it hasn't been a great investment and this move reduces the company's risk profile," he said.